C-It-Loci is a tool that contains four types of data: "Conserved Regions", “Genes", “Transcripts", and "Expressed Transcripts". Three of these are searchable/browseable via their corresponding links. Each row within these pages links to a page containing RNA-seq data from a variety of tissues with other useful data. Each data type can be accessed by clicking the corresponding link on the navigation bar at the top of the page. This will direct to the page containing search form and a table of entries. 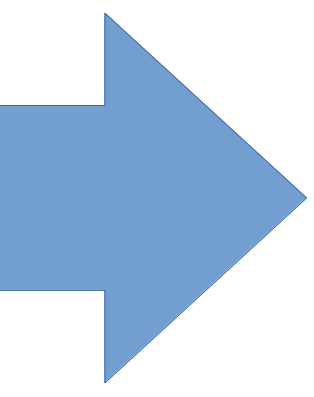 See Browsing and Searching below for directions on navigating and searching C-It-Loci. CGP: “C-It-Loci Genome Position”, which is a region in which pairs of adjacent homologous protein-coding genes shared between one or more species. UCNEbase: regions defined by the database for ultra-conserved non-coding elements (UCNEs) called “UCNEbase” (http://ccg.vital-it.ch/UCNEbase/). For details about UCNEbase, please see: Dimitrieva S, Bucher P (2013) UCNEbase--a database of ultraconserved non-coding elements and genomic regulatory blocks. Nucleic Acids Res 41(Database issue):D101-9. VISTA: loci that are +/-300kb from the regions defined by the VISTA Enhancer Browser (http://enhancer.lbl.gov). For details about the VISTA Enhancer Browser, please see: Visel A, Minovitsky S, Dubchak I, Pennacchio LA (2007) VISTA Enhancer Browser--a database of tissue-specific human enhancers. Nucleic Acids Res 35(Database issue):D88-92. It is advised to use C-It-Loci's advanced search. However, in many cases, simplified search offers a useful and simple graphical method to search and to compare data. 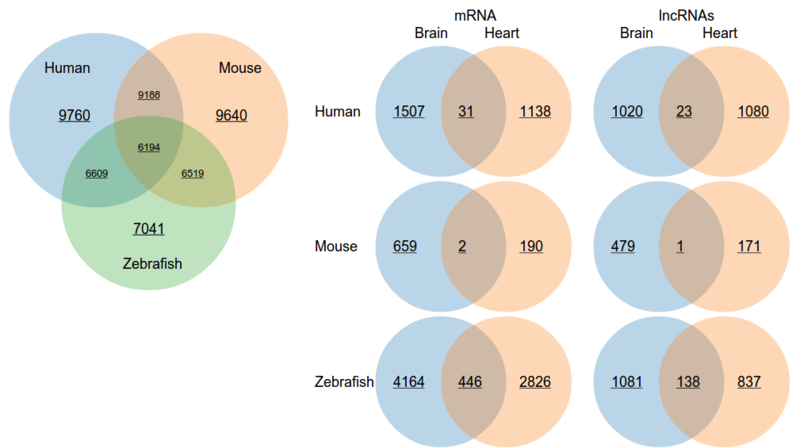 Upon submission, quick search will return Venn diagrams displaying the numbers of conserved regions, protein-coding transcripts, and lncRNA transcripts. Select tissue 1 (Required) - Specifies the primary tissue for the search, which is shown as the blue circles of the Venn diagrams on the left. Select expression 1 (Required) - Determines the type of expression shown by the Venn diagrams. Select tissue 2 (Optional) - Allows for comparing a secondary tissue to the primary tissue, which is shown as orange circles on the right of Venn diagrams. Select expression 2 (Optional) - Determines the type of expression shown by the Venn diagrams. GO - Clinking this button will submit the query. To preform a quick search, the top selection boxes for a tissue and expression type must contain a tissue and expression value. The second row of tissues and expression types is optional, however, both must be set for the form to be valid. Note: the 'GO' button will be disabled if the form is not valid. The large size of C-It-Loci necessitates breaking queries into manageable sizes. This is accomplished via the browsing view. The browsing view breaks queries into pages of a given number of rows and allows navigation between pages via the “Previous” and “Next” buttons. Navigation to a desire page is also possible by setting the page number field to the desired page. The number of rows to show per page. Record pages contain detailed information about a data type contained within C-It-Loci. This can include annotation data, genomic coordinates, expression data, homologs, and GO terms depending on the data type. There are two ways to view expression data: a graphical view and a text view. Users can toggle between the two views using the provided buttons. The text view is a simple table comparing various transcript expressions versus tissues with numerical values representing the average FPKM values followed by the standard deviations with ± symbol. The graphical view scales the FPKM values using the equation y = 100.0 - (log(x)+12)*((3*x)/(x+1)+1), where y is the lightness value in the HSLA color.